Mechanical Gauges is the best instrument to measure High Fluid Pressure in hydraulics engineering, where Tube Gauge cannot be conveniently used. The principle on which all Gauges work is almost same. 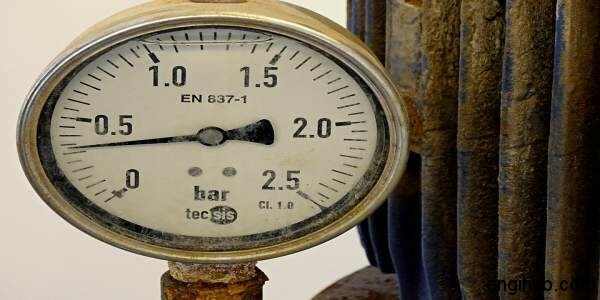 Here in this post, you will find the information three important mechanical pressure gauges. The Bourdon’s Tube Pressure Gauge is most suitable to measure the pressure of the fluid, above or below the Atmosphere Pressure. So, in its simplest form consists of an elliptical tube, ABC bent into an arc of a circle. This bent-up tube is connected to the fluid at C (inlet of Fluid), the pressurized fluid flows into the tube, as a result of the increased pressure, tends to straighten itself. The tube tends to become circular as it is encased in a circular cover. With the help of simple Pinion and Sector arrangement, the elastic deformation of the Burdon’s tube rotates the Pointer. This Pointer moves over a Calibrated Scale. This directly shows the Pressure. This Pressure Gauge is also used to found out the Pressure of a Fluid, above or below Atmosphere Pressure. Instead of Bourdon’s tube, a Corrugated Diaphragm is used; hence it is called Diaphragm Pressure Gauge. When the Gauge is connected to the Fluid at C(inlet of Fluid), causes some deformation of the Diaphragm due to fluid pressure. With the help of some Pinion arrangement, the elastic deformation of the Diaphragm rotates the Pointer. This Pointer moves over the Calibrated Scale. This directly shows the Pressure. A Diaphragm Pressure Gauge is generally, used to measure relatively Low pressure. This type of Pressure Gauge is generally used for the Calibration of the other Pressure Gauge in a Laboratory. So, in its simplest form, consist of a Piston and a Cylinder of known area and connected to a Fluid by a Tube. A Pressure Gauge, to be calibrated, is fitted on the other end of the tube. By changing the Weight, on the Piston, the Pressure on the Fluid is calculated and marked on the Pointer.